July 9/10 saw the return into battle of SRTC and BTC…the first since 2012 for The Doug Grant Trophy. After a warm-up event against The Wanderers on Friday night, Sydney started off quite well winning three of the first four matches before lunch on Saturday. The lunches were superb all weekend! It is highly possible that SRTC couldn’t quite pick the better of the sandwiches, because after lunch results went narrowly the way of BTC in five of the six matches. Saturday saw 6 of 10 matches ending in a 9/8 result and Ballarat led the scoreboard 7/3 at the end of Saturday. Sunday’s play brought a reversal of fortunes with Sydney winning the day 4 matches to 1. But it wasn’t to be, and Ballarat won the Trophy back with an 8 to 7 victory. 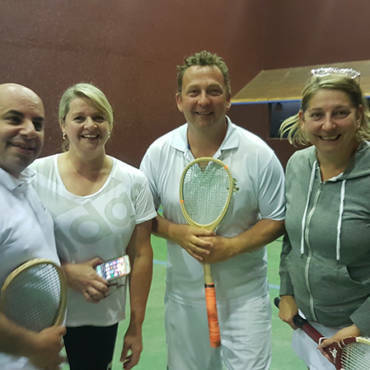 Sydney had a new member playing his first match of Real Tennis, after playing the game some four years ago “….. oh, for maybe an hour or so”!! David Brell improved rapidly, and despite being a little in the dark about the score at any particular time, was able to find the sweet spot regularly, and with some power. His serving improved out of sight by Sunday afternoon, and hopefully he has caught enough of the bug to encourage him to remedy the itch by getting back on court with Sydney in the future. This kind of thing is an unexpected benefit of the re-formed SRTC, and the completely new players they have introduced the game to are developing into great additions to our ‘’Real Tennis family’’. Many thanks to Sydney for heading down this way Sydney and congrats to Ballarat on the weekend win!! So….the Doug Grant Trophy remains in the BTC cabinet, but this time, legitimately.